The Finviz stock screener is one of the best free screeners that allow you to scan for stocks and look at them visually through a chart. The word "Finviz" is short for financial visualizations and I think they name it very well. You can scan for stocks and they will put it in charts so that you can easily look at the stocks at a glance. This website allows you to scan for stocks by description, technicals and also fundamentals. Best of all the majority of the tools are free. For swing traders and longer term traders, all the free tools are enough for you to find profitable trades. When you go to the Home Page of Finviz, you will immediately see the potential of this stock screener. Even on its Home Page, there are tons of useful links that allow you to find some of the best trading candidates. You will see the 3 major indices at the top. The Dow Jones, the Nasdaq and the S&P 500. I think they really did a good job putting those 3 main indices there because if you are trading US stocks, you should always be aware of what they are doing. At the far right, they also enable the users of this website to vote during market hours whether they are bullish or bearish in the next 5 min. Imagine being able to have a list of stocks each day exhibiting different signals on a single page. You can find a huge amount of signals using Finviz. These kind of list makes it easy for you to find trading candidates for a particular trading strategy. For example, if you like momentum stocks, you might click on stocks making new highs. 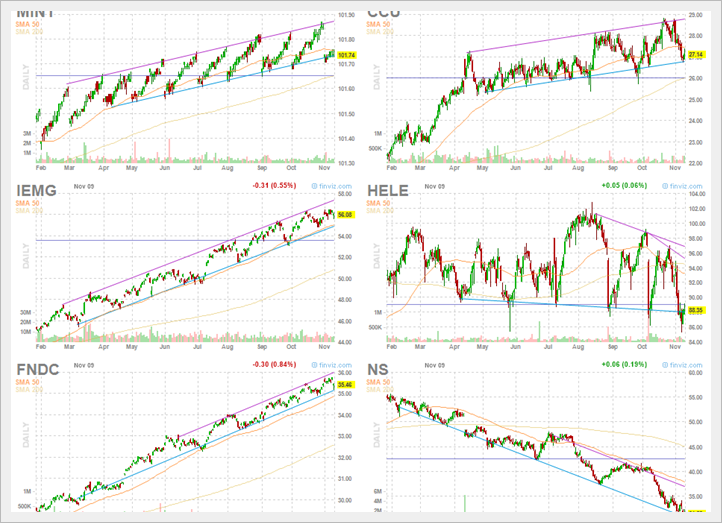 Stocks that are making new highs are hot and may provide some great momentum day trades. Those who are intrigued with insider buying or selling may also find the list useful. You might find a gem when you see some insiders buying the stock in their company heavily. If you are a fan of technical analysis and use technical chart patterns to trade, then you might find their list of stocks by technical signals very useful. They have an impressive list of technical signals for you to look at. Things such as trendline support, trendline resistance, horizontal support and resistance, wedge up, wedge down, ascending triangles, descending triangles, channel up, sideways channel, channel down, double top, multiple top, double bottom, multiple bottom and head and shoulders. I have taken a look at them but I still think all these are computer generated algos which you still need to filter with your own eyes. Anyway if you are a person who likes to play for example the double bottom pattern, you might find it useful to look at the list. But in the end you still need to make your own judgments. Probably out of 100 double bottoms you see, you might only find 1 or 2 suitable trading candidates. 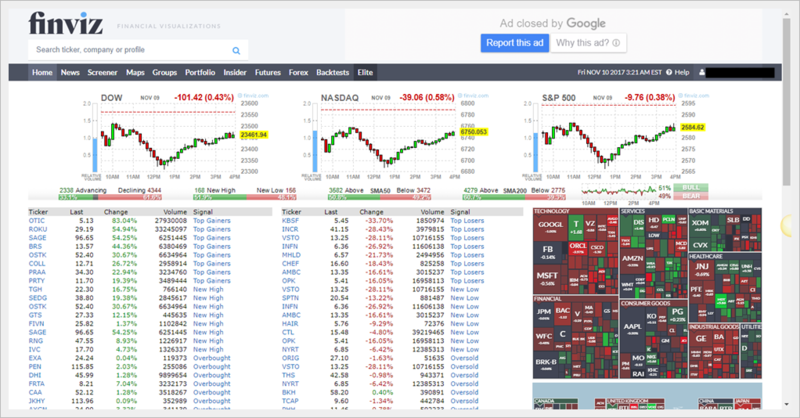 The beauty of this website is when you click on the link to the different signals, you can actually view a list of stock charts on a single page so you can easily have a bird's eye view of these stocks. One of the things that is very interesting in the stock market is to look at insider buying and selling. Some of the amounts that insider buy and sell will really amaze you. Like a CEO who sells $200 million worth of shares. That is an amount that most traders won't even earn in their lifetime! Of course sometimes insider buying and selling can point to important things that are happening in the stock. An insider who is purchasing lots of shares in the company might have some inside knowledge that the stock price might double by next year. On the other hand, if the insider starts to sell a substantial amount of his or her stake in the company, it might point to a deterioration of the health of the company. I really like the way Finviz puts these insider trading information. They will list the company, the name of the insider, their position in the company and the cost, number of shares and value. It gives you a quick overview of what happened in that insider trading. It is important to note that not all insider buying or selling is illegal. If they follow the law, then it will be alright. Sometimes the CEO of the company might just need some extra cash so they sell some of the shares in their company. Check out the latest insider trading above. As we all know, Amazon hit new highs and Jeff Bezos is now the richest man in the world. It is interesting that Bezos has sold about $860 million worth of Amazon shares. Well we don't know why he sold them. Maybe he just needs some cash to purchase other things. Is this a big news? Well, $860 million is a lot of money to the rest of us but I think its really nothing that will affect Amazon as $860 million is just less than 1% of his net worth. According to Forbes, he is now worth $95.1 Billion (At the time of this writing). When you click on the Screener button on the site, it will bring you the ability to scan for stocks based on Description, Fundamental and Technical. Although the filters are not as complete as some custom stock screeners, they still offer you with lots of ways to filter stocks. For the purpose of swing trading and position trading, I think the stock screener that Finviz offers is quite good.